Now Released! Green Book 5th Edition on NHLP's Digital Library! Each purchase provides a one-year subscription to the digital Green Book online and a free print copy mailed to you! 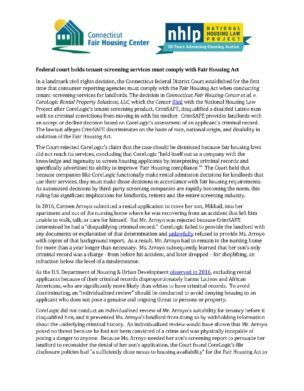 In a landmark civil rights decision, the Connecticut federal District Court established for the first time that consumer reporting agencies must comply with the Fair Housing Act when conducting tenant-screening services for landlords. Click the title above to download the full press release. NHLP has updated the Utility Allowances, Energy-Efficiency, and Renewables in Affordable Housing initiative webpage with a new entry under the ‘Manuals, Guidebooks, and Reports’ section.